TULSA, Okla. - Allison Hall, a court reporter for 18 years, says there’s a national shortage for court reporters. Hall says Oklahoma is about 300 hundred court reporters short. Currently there are between 375 and 400 court reporters working in Oklahoma. Hall says the Tulsa County case flow has slowed down as a result of the shortage. She says fewer cases are being litigated, because there aren’t enough court reporters available for court proceedings. The situation has captured the attention of Oklahoma Supreme Court Chief Justice Doug Combs. This year, he formalized a task force dedicated to investigating solutions to this shortage. Experts says in the next few years the trouble will be problematic for court systems. Tulsa County Court Administrator Vicki Cox says backlogged cases aren’t something they keep a count on. However, she did state that officials have noticed the shortage of court reporters, and it’s becoming a problem. 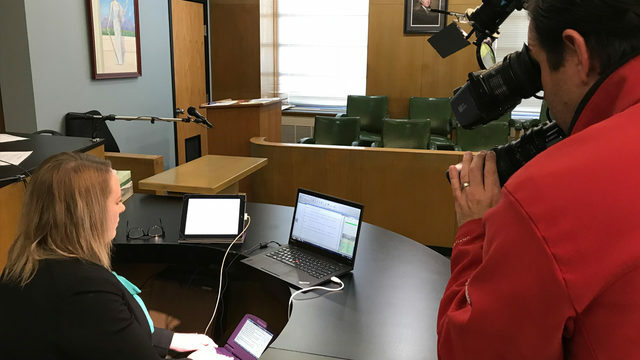 Tulsa Community College and Gordon Cooper Technology Center are both currently enrolling students to train them to become court reporters. It takes two years to finish court reporting school, and salaries typically start at $40,000. Court reporters also provide close captioning for sporting events, depositions for attorneys, live closed captioning and captioning for deaf individuals. More than three quarters of court reporters are in their 50’s and 60’s.